Little boys seem to always have an obsession with everything fireman, so these Fireman Birthday Party Ideas are going to be a hit at your next birthday celebration! What great ideas! Are you all set to get the firefighter party supplies and decorations out and about for your little guy’s birthday? 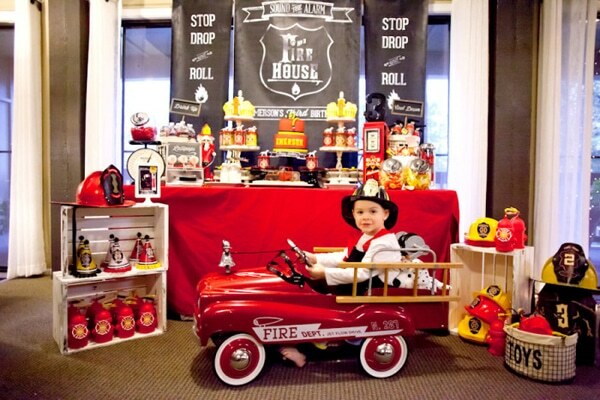 Every boy wants to be the fire chief of his squad at some point, and this birthday theme will let him do exactly that! And how cute are little kids in fireman hats that are too big for them?! We just love this classic theme that will never go out of style. If flames and fire are all your little guy likes to focus on when you’re outside at the campfire, it may just be time to kick this party planning into high gear! Who doesn’t love a Firefighter Birthday with red fire hydrants, cute hats, and lots of fun fire station decor. These Fireman Birthday Party Ideas are going to have you all prepared way before it’s time to open the door and welcome your guests! So fun! And luckily you’ve come to the right place to find the best firefighter party supplies and decorations. Just look at all of these fun Fireman Birthday Party Ideas! There are almost so many that you are going to want to make this your little guy’s theme more than once! 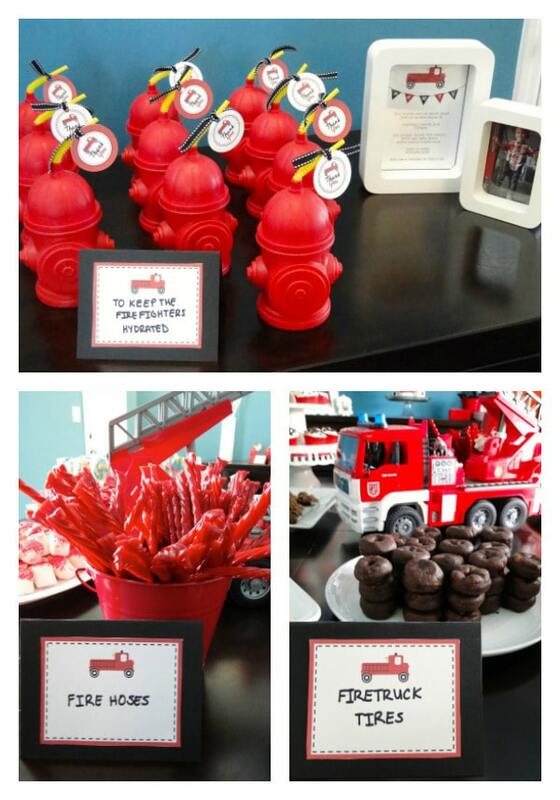 Let’s take a look at these great Fire Truck Themed Birthday Party Ideas up close and personal! You are going to love every single one! 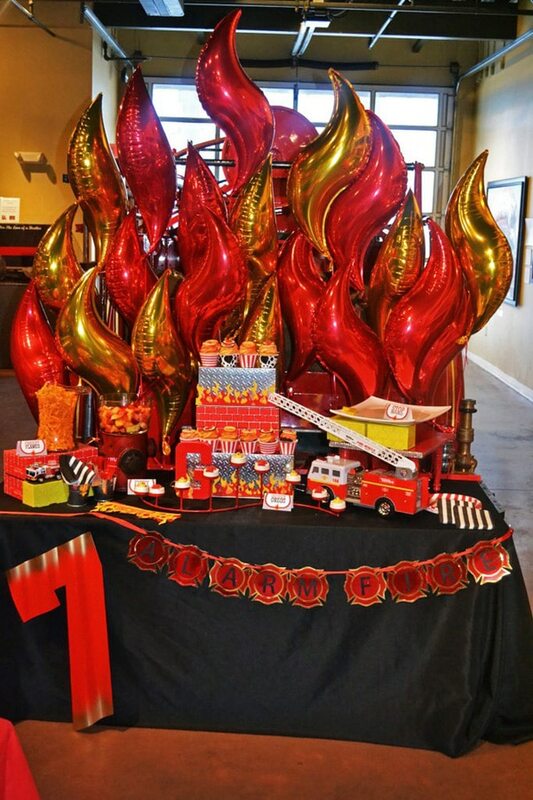 How amazing is this great Fireman Birthday Dessert Table?! 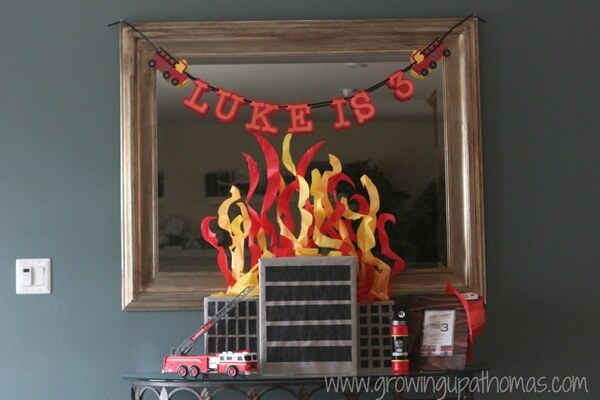 Firefighter themed party decorations are found everywhere and the backdrop is so simple, but perfect! We love how the bright red, yellow and orange colors pop out at you. 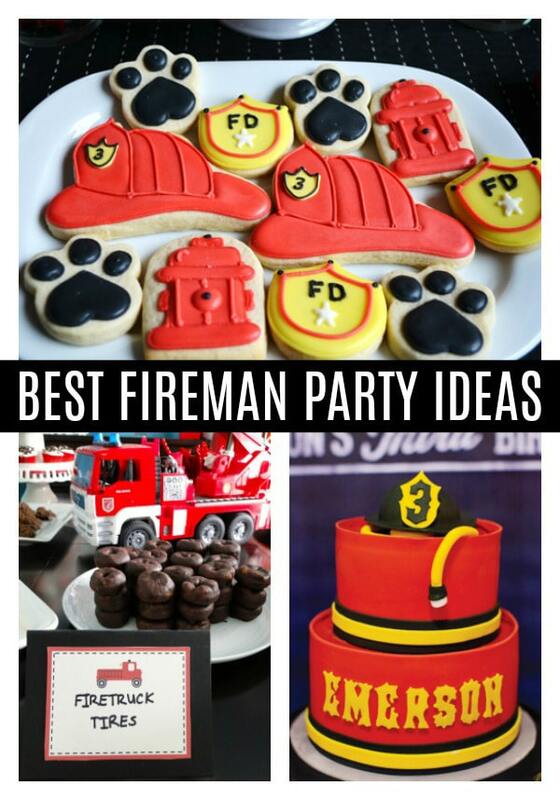 All of the little firefighters will love these amazing firefighter party food ideas too! We also love how the wood boxes are simple, easy, and attractive ways to give height to the dessert table. You don’t need to go out and purchase a whole new set of plates and serving ware. Just use what you have and get creative! 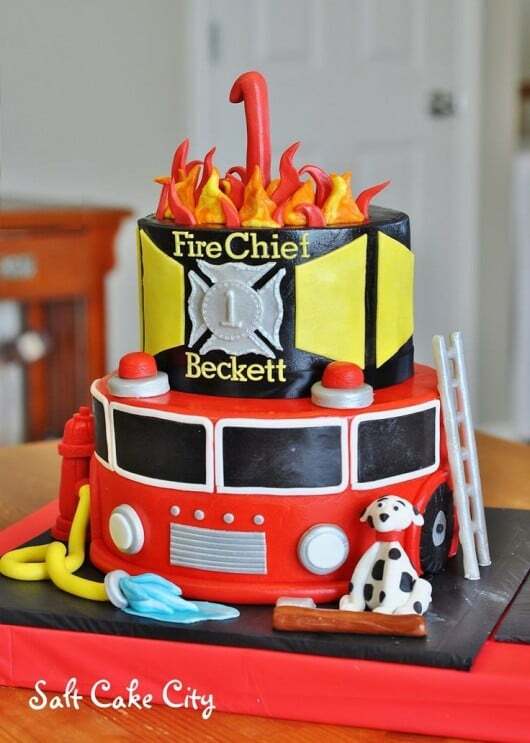 What an adorable Firefighter Birthday Cake! Fireman hats are the perfect firefighter cake topper. This is almost too cute to cut apart! It may be the best fire truck we have ever seen, and it’s edible! Even better! How cute is that little fire hydrant on the side of the fire truck? And the water hose? It almost looks real. What an amazing job creating this little guy’s firefighter cake of his dreams! 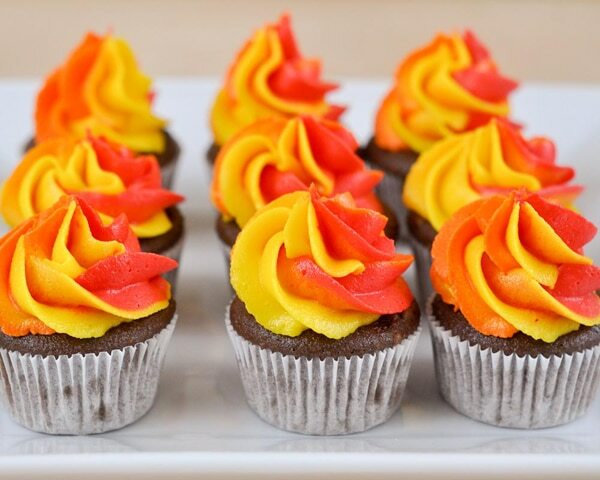 These amazing Firefighter Party Cupcakes will put a flame in any party! These are totally doable for a DIY dessert and you can have them finished up and ready in no time. Cupcakes are always a hit with the kids, so don’t feel like you always need to spring for a big fancy cake. It’s a much more budget-friendly option that you can totally tackle yourself! It’s always easy to make cupcakes and frost them one color, if you’re a little scared to try the mix. Then just find some great firefighter cake toppers, place them on top of the cupcakes, and voila! You’re done! OK, these sweet Fireman Party Cookies remind me of Paw Patrol, so if you have a Paw Patrol party, these would be a great addition, as well! 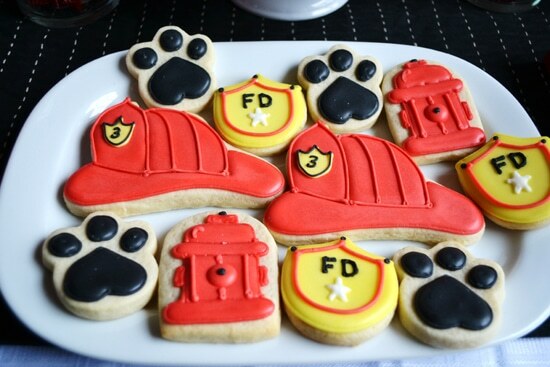 All of the fun things found at a fire station are included in this assortment of customized cookies and we absolutely love them. We bet all of your party guests, and the big birthday boy, are going to love them, too! These are the BEST firefighter party food ideas! Take a peek at these Fireman Party Ideas and Decorations and you’ll know exactly what to do when it comes to your own Fireman Birthday Party. Those drink holders couldn’t be any cuter and how easy are the food ideas above?! They don’t require any major cooking time and can be presented in a low-key fashion, too. What a great idea to frame one of the firefighter birthday invitations for the party, as well. It’s simple, easy, and free to add a little extra decoration to your event, and a great way to show off those invitations you really loved putting together for your special birthday boy. 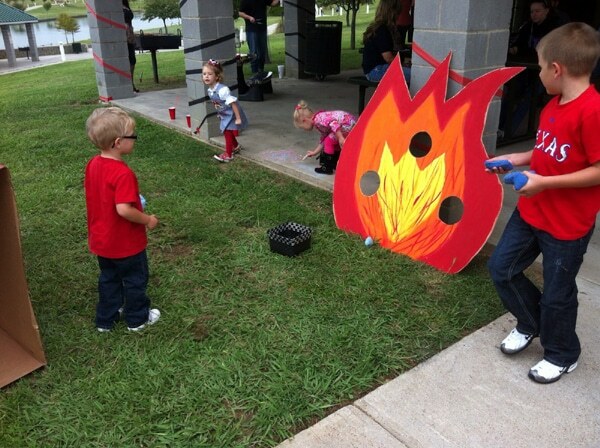 This Fireman Flame Toss Game is a great way to get the kids out and about and moving around during your big Fireman Birthday Party! Fireman games just have to be active, so make sure you get those kids moving! Maybe creating a fireman obstacle course, or racing fire trucks would be great to add, too! Anything you can do to tucker out those little boys is always a plus with the parents. We know how much energy they have and it can be near impossible for them to wind down! WOW! This is an incredible fireman birthday cake! Wow! Did we mention WOW?! A Firefighter Themed Birthday Cake is the thing that dreams are made of when you are picturing what a Fireman Birthday Party could be! This is absolutely amazing and it even has its own little Dalmatian waiting patiently for the kids to come and sing Happy Birthday! What an amazing centerpiece for the dessert table. One of the biggest questions so many people have are what to give away for party favors. That’s why these Fire Truck Favor Boxes take the guesswork out of all of the other planning that needs to be done! Load them up with fun firefighter supplies, candy, or some of those impressive customized cookies that are individually wrapped, and you’ll be all set! 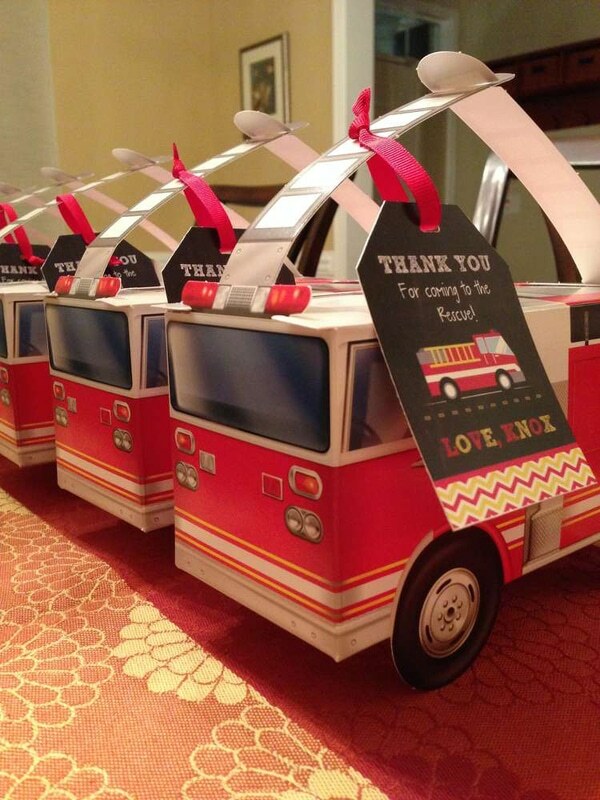 The kids will absolutely love their fire truck favors! The Fireman Birthday Party Decorations here are super impressive! Just check out the backdrop of that burning building for the tablescape. And we love the firefighter party supplies and decorations that are used for the place settings for the junior firefighters! What a great idea to give everyone their own little bucket. This makes it easy to collect all of the fun things that kids get from one party station to the next! This Sound the Alarm Fireman Party supplies tons of great Fireman Birthday Party Ideas for your next birthday bash! 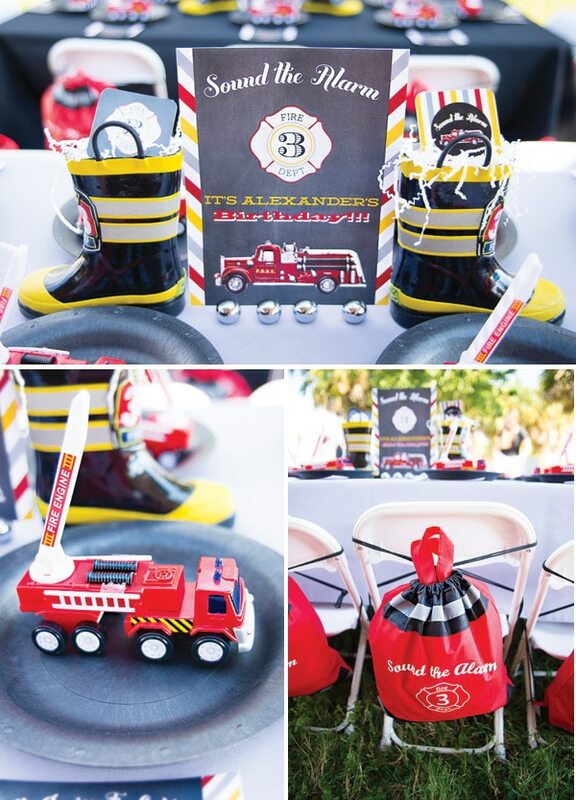 How creative to incorporate little fireman boots and fire trucks to decorate the party. 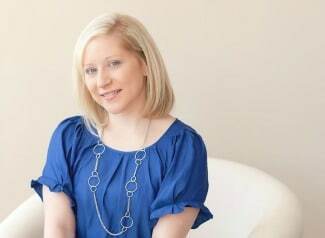 Simple, easy, yet oh so adorable! Creating gift bags that are set at each place setting is a great way to make sure nobody forgets their goodies at the end of the birthday party, too. No fireman left behind! Look out! This Fireman Birthday Party is on FIRE! These Fireman Party Decorations are lit! We love all of the ideas that we see, especially the crepe paper that is used to simulate flames. What an easy and effective way to bring the firefighter themed birthday to life! This is a great table display for all of the guests to be a part of and to enjoy. We bet you’ll get a lot of compliments on this fireman party idea! This little firefighter is ready to party! And, this Firefighter Birthday Party looks like one fun bash! From the fireman hats to the classic little fire truck, this guy is ready to put out some fires! 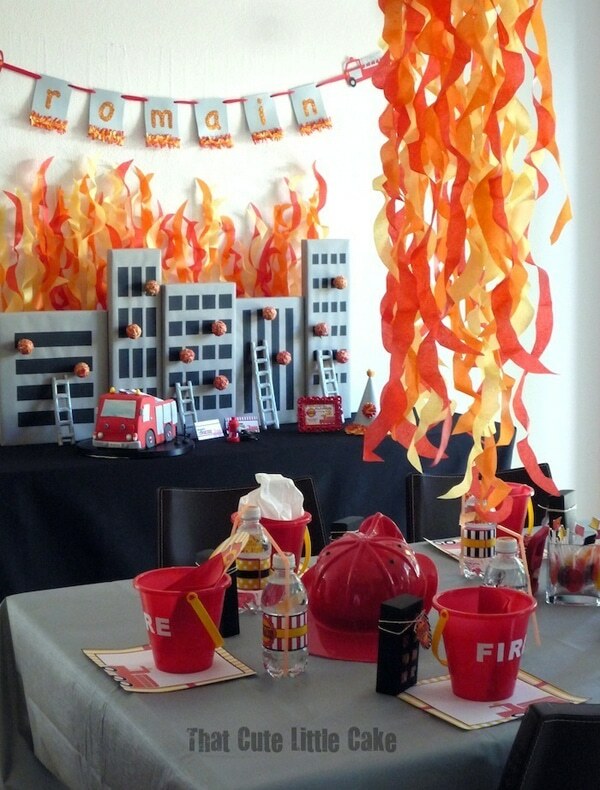 We really love the personalized backdrop that was created in this Fireman Themed Party, as well. The dessert table looks absolutely amazing! Having your Fire Truck Birthday Party outside, if it’s possible, is even better! 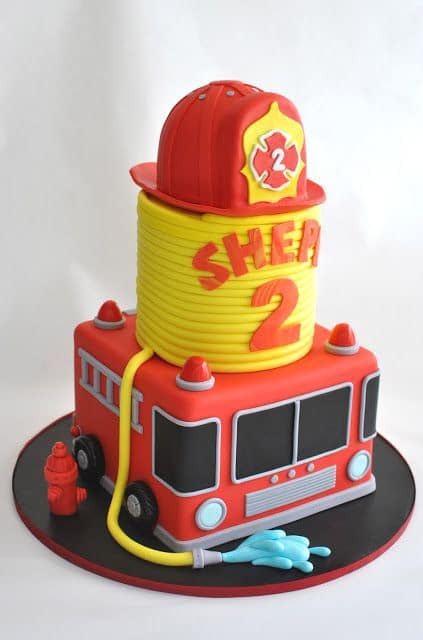 No need to worry about cleaning up inside, before or after your big Fireman Birthday Party! 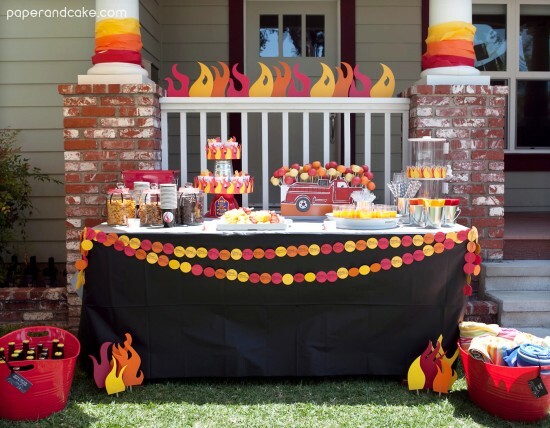 With this party theme above, we love how the red, orange and yellow card stock creates the great flames that are an integral part of this fun dessert table. Having a black table cover really helps the bright colors to stand out, as well! Fireman Party Food doesn’t just have to be for the kiddos! Maybe you just need to make this table a little harder to reach! Not only do we love the food and shot ideas above, but we really love the tent cards that were created to describe all of the food items, as well! 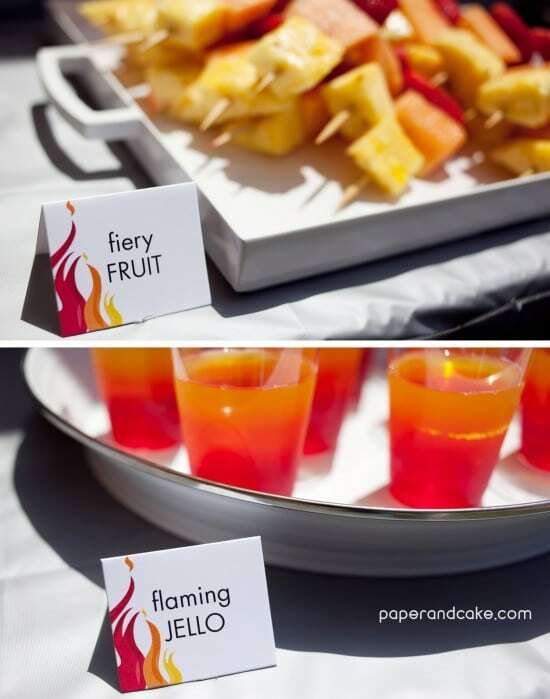 And maybe we’d like to get our hands on some of those flaming jello shots, as well. We bet they are absolutely delicious! After all, planning a birthday party can take a lot out of us, so it’s time to refuel, right?! This Fireman Birthday Dessert Table didn’t miss a thing! The fire and flame firefighter balloon backdrop absolutely steals the show for this fun Fireman Birthday Party. It almost feels like you are going to walk right into a fire the closer you get. We love these! And of course, this dessert table leaves nothing to the imagination. It includes everything and all of your party guests are going to go bananas when they see it! They may just want to take that little firetruck around for a spin, as well! 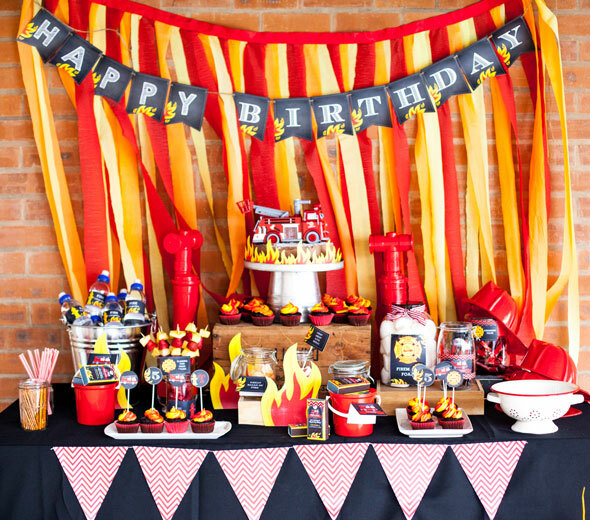 And just like that, you have yourself tons of great Fireman Birthday Party Ideas! This party is going to be red-hot and will be sure to be a 4-alarm celebration! Don’t worry, you won’t have to extinguish any real fires and hopefully all of the fun this party provides will be combustible! Your little firefighter is going to absolutely love his big day and with all of these great ideas, you won’t have to worry about being one hot mess when it’s all said and done. Enjoy! For more kids party ideas, follow us on Instagram @prettymyparty and Pinterest and join us in our private Facebook group.